Based on comprehensive research activities and the support of the European Commission, Intelligent Transport Systems (ITS) will soon reach market introduction. Vehicle-to-Vehicle (V2V) communication centres particularly on application scenarios in the area of traffic safety and efficiency, as for instance Green-Light Optimal Speed Advisory or Traffic Jam Ahead Warning. The recently defined standard IEEE 802.11p for inter-vehicular communication, designed according to the specific requirements of V2V interaction, constitutes an essential step towards this next phase. However, since message exchange between vehicles is based on vehicular ad hoc networks (VANETs), V2V interaction is subject to large network effects. Due to the short reach of inter-vehicular connections, a certain market penetration is required to provide value for drivers. Vehicle-to-Infrastructure (V2I) communication represents the second field of ITS. It covers the information exchange between vehicles and roadside infrastructure equipped with wireless communication technology such as traffic lights or warning signs for road works. V2I facilitates the interaction of vehicles and roadside units to enhance the aforementioned application scenarios. Moreover, those units may be used as additional hops to augment the reach and thus the overall value of inter-vehicular communication. Besides V2V and V2I, the commercial introduction of UMTS, WiMAX and similar broadband wireless access technology, as well as the proliferation of WLAN-based (IEEE 802.11) multihop access networks and hotspots, paves the way for the second generation of telematic services. Such technology allows vehicles to be connected to the Internet and therefore with a broad range of service providers. In addition to infotainment and entertainment services, this Internet of Vehicles facilitates the interconnection of vehicles with commercial business services provided by enterprise applications. For that reason, the second generation of telematic services is referred to as Vehicle-to-Business (V2B) communication. V2B covers a multitude of application scenarios, as for instance remote management of embedded systems, Vehicle Relationship Management (VRM), and the novel insurance concept of usage-dependent tariff models such as Pay As You Drive. Figure 1 illustrates a scenario that includes the three depicted vehicular communication types V2V, V2I, and V2B. Figure 1: Overview of vehicular communication. The main challenges for an efficient V2B communication are the uncertain connectivity of vehicles, the frequency of changes in network topology due to the vehicles mobility, as well as their resource-constrained onboard units. 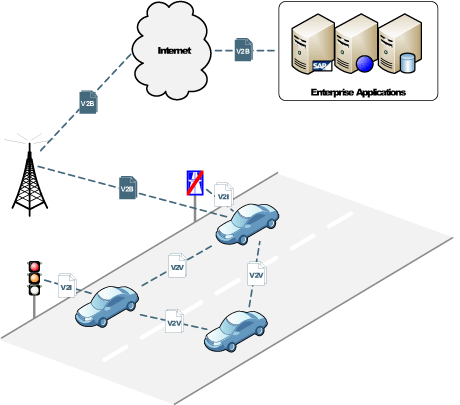 To account for these demands, SAP Research is currently working on a service-based, distributed integration architecture based on state-of-the-art technology to realize a flexible, scalable and secure V2B interaction covering a multitude of vehicles and diverse (legacy) enterprise applications. 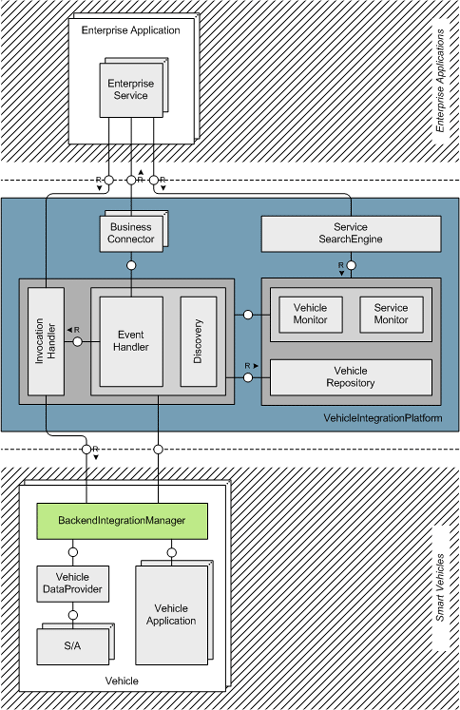 Based on the complementary architecture patterns Service-Oriented Architecture (SOA) and Event-Driven Architecture (EDA), the V2B integration architecture specifies two dedicated components: the Vehicle Integration Platform (VIP) as a back-end system and the Back-end Integration Manager (BIM) as the related in-vehicle component (Figure 2). Figure 2: V2B Integration Architecture. The VIP is a Web services-based back-end system that covers multiple components to realize an efficient information exchange between vehicles and enterprise applications. It comprises a message broker (EventHandler) that enables a topic-based publish/ subscribe interaction style, thus enhancing the decoupling of vehicles and enterprise applications. Moreover, the InvocationHandler component facilitates the invocation of vehicle applications and provides a buffering mechanism to account for their intermittent accessibility. Finally, the VIP embodies several components to discover, organize (eg identity management) and search for functionality offered by vehicles. The in-vehicle component BIM is designed to connect a vehicle with the VIP and hence with enterprise applications. It encapsulates vehicle applications as Web services and provides additional functionality such as message caching, message prioritization and the rescheduling of message delivery. The BIM thus applies the Devices Profile for Web Services (DPWS) specification, which allows for secure Web services operations on resource-constrained devices. V2B communication provides invaluable potential for both service providers such as vehicle manufacturers and insurance companies, and the drivers as end customers. Thus, for example, VRM covers the periodic polling and analysing of in-vehicle systems and sensors by a vehicle manufacturer. Such a large amount of product life-cycle data might be used to improve the product design and quality or to enhance the planning of production and procurement. Hence, VRM might result in a reduced forecast error and a decrease in safety stocks. Moreover, information about driving behaviour can be analysed to provide personalized product and service offerings, which comprise warranty and maintenance as well as value-added services. An effectively operated VRM might further result in an intensified and enhanced Customer Relationship Management (CRM) due to the potential growth in customer loyalty. The ability to make use of a comprehensive set of vehicle data during the entire life cycle as well as the offering of customer-specific services facilitates not only enhancements of existing services but also the identification and realization of novel business models. The aforementioned usage-dependent insurance concept Pay As You Drive represents only one example of the overall potential. Due to its modular design and the application of state-of-the-art technology, our V2B integration architecture provides a valuable foundation for further developments to the Internet of Vehicles.